No trip to Arizona is complete without seeing the Grand Canyon, whose beauty is well worth the 90 minute drive from Flagstaff. Travel on a guided 10-hour group tour to one of the Seven Natural Wonders of the World, learning about about the landscape as you go and avoiding the hassle of fees and parking in one of the United States’ most popular National Parks. Stop along the way to view famous landmarks, eat dinner, and catch the sunset. Meet your guide at your hotel in Flagstaff prior to a 1 p.m. departure time. Snake your way through the desert expanse of Coconino National Forest en route to Grand Canyon National Park, stopping to admire views of the 12,600-foot tall San Francisco Peaks, the Painted Desert rock formations, and the Native American artwork at Cameron Trading Post. Drive along the edge of the Grand Canyon, passing its most famous overlooks: Desert View, Lipan Point, and Yavapai Point. Learn about the history of the area as you go from a driver with extensive knowledge and entertaining stories alike. 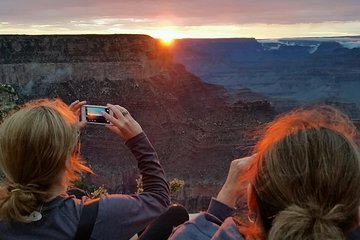 Complete your trip with a special viewing of the sunset over the Grand Canyon, followed by dinner at the historic Bright Angel Lodge, before returning to Flagstaff. The weather had cleared up for this trip and the views of the canyon were spectacular. Unfortunately our guide for the day was not as informative or friendly as the other two guides. Great tour. The guide was extremely knowledgeable and friendly. We felt really well cared for during the day and we learned so much. This is such a great way to see and learn about the Grand Canyon.